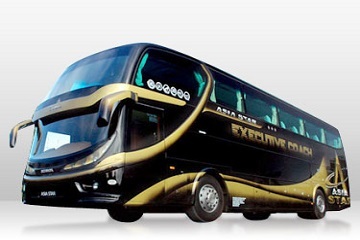 Incorporated in October 2010, Asia Star only vision till then is to leading light in this transport industry by growing the level of professionalism of handling luxury executive coach business that will be likeable to the public as a transport solution. 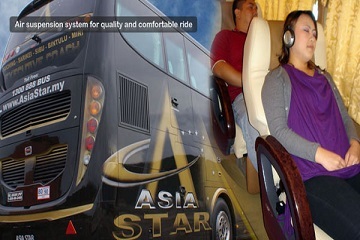 Asis Star has been providing bus to Miri, Kuching, Sibu, Bintulu and likewise. Asia Star also aims to cultivate the trust of the public and people within the organisation trust, in order for Asia Star to emphasis in the building of social equity. Lot 465, 8th Mile, Jalan Kota Samarahan, 94300 Kuching, Malaysia. Lot 2922 & 2923, 3 1/2 Mile, Jalan Datuk Tawi Sli, 93250, Kuching. S/L 71, No 16, Ground Floor, Lorong Pahlawan 7, 96000, Sibu. Counter No 10, Sibu New Bus Terminal, Jalan Pahlawan, 96000, Sibu. No 109, Serian Bazaar, 94700, Serian. No 165, Jalan Diponegoro, Pontianak, Kalimantan Barat, 78117, Indonesia. Counter No 1, Bintulu Express Bus Terminal, Jalan Medan Jaya, 97000, Bintulu. Counter No 2, Sarikei Express Bus Terminal, Jalan Nyelong By Pass, 96100, Sarikei. Lot 335, Block 8, MCLD, Jalan Lilium 2, Padang Kerbau, 98000, Miri. Counter No 7, Miri Express Bus Terminal, Pujut Corner, Jalan Padang Kerbau, 98000, Miri.